We believe Viessmann is one of the best boiler options available to homeowners in the the UK in 2017 and into the future. Condensing technology not only utilises the heat generated by combustion as a measurable temperature of the hot gases (net calorific value), but also the water vapour content (gross calorific value). 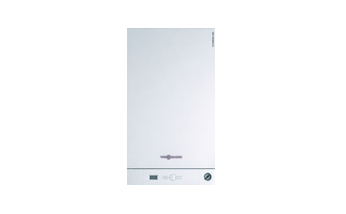 Condensing boilers are able to extract almost all of the heat contained in the flue gases and to convert it into heating energy. Condensing boilers use high performance heat exchangers. These cool the flue gases before they escape through the chimney, to the extent that the water vapour contained in these gases is deliberately condensed. This releases additional heat which is transferred into the heating system. 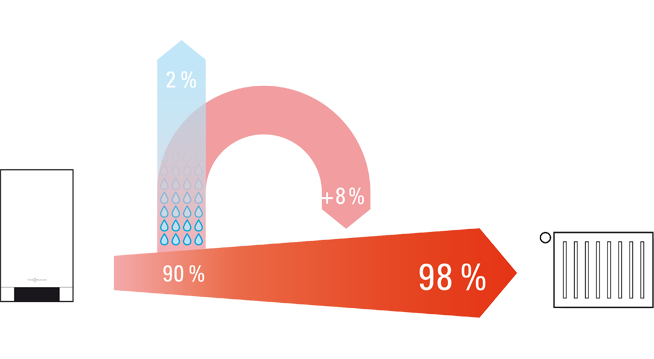 With this technology, a gas condensing boiler achieves a standard seasonal efficiency [to DIN] of up to 98 % (relative to Hs). Condensing boilers are therefore particularly energy efficient, looking after both your wallet and the environment. The gross calorific value (Hs) defines the amount of heat released by complete combustion including the evaporation heat latent in the water vapour of the hot gases. With condensing technology, not only is the heat from the combustion of fuel oil or gas utilised, but also the heat that, with non-condensing heating technology, would otherwise escape unused up the chimney. Condensing boilers extract almost all of the heat latent in flue gases and convert it into additional heating energy. To do this, Viessmann condensing boilers are equipped with stainless steel Inox-Radial heat exchangers, which cool the flue gases before they are routed into the stack, to the extent that the water vapour contained within them is deliberately condensed, transferring the additional heat released into the heating system.